At our fingertips is the power to communicate. Videos. Photos. Eulogies. Rants. There is no escape from it; an addictive chatter that’s pushed through the ether, seeking out the curious. Living room. Workplace. Street corner. Shop. A reflection of the times we live in, for better or worse. Tweet. Upload. Post. For those awaiting this month’s new dawn for the Borders’ lost Waverley route, our digital world has built palpable expectation, opening a window on the alignment’s transformation from wilderness to modern transport corridor. Twitter feeds charted the track laying machine’s advance towards the terminus at Tweedbank, whilst monthly podcasts and a regular YouTube series examined the line’s whys and wherefores from every conceivable angle. Installation of track at the tunnel's south portal. Local journals fulfilled much the same role in the 1840s when the North British Railway originally constructed the section that is now reopening, as part of its line linking Edinburgh with Hawick. Though rather less immediate than rolling news and social media, the stories they told were altogether more colourful. Life was back then. Take as an example the events of Sunday 1st March 1846. In the early hours of that morning, the police lock-up at Gorebridge was occupied by a pair of the railway’s Irish navvies, charged with stealing two watches. This apparently minor misdemeanour might have gone unnoticed had things not escalated into a murderous riot when around 150 men assembled, intent on liberating their workmates. All hell broke loose. Sergeant Brown and Constable Christie, on duty inside, offered futile resistance, the latter sustaining serious arm injuries whilst the former had a gun pointed at his head. The cell doors were forcibly opened, the prisoners released and the mob then marched off towards Fushiebridge where they encountered constables Pace and Veitch returning from their rounds. The vengeance they wreaked was ruthless, subjecting Pace to a savage attack during which he was struck on the head with a pickaxe, opening his skull. He was left for dead in the road; Veitch escaped after being “severely maltreated”. Order was restored by 13 arrests but when, on Monday morning, the English and Scottish labourers heard of the policeman’s demise, 2,000 of them descended on Crichton Muir where the Irish gangs were employed, armed with bludgeons and hammers. Hopelessly outnumbered, it would have been a bloodbath had the Irishmen not got wind of the approaching hordes and fled. Instead, spleens were vented on the 20 wood and turf huts used as lodgings, razing them to the ground by fire. Four miles north of Galashiels, life at the navvy encampment next to Bowshank Tunnel - accommodating 300 men - was comparatively dull, save for occasional poultry thefts and a fatal outbreak of cholera which struck just as work there drew to a close in February 1849. The tunnel contributed to the 140 structures requiring remediation or reconstruction for the new Borders Railway, but the character of the challenge at Bowshank must have looked easy-going alongside that confronting John Miller who engineered the tunnel for the North British 160-odd years earlier. It’s clear that things did not go well. To the south of Falahill Summit, the route falls to meet Gala Water which it crosses 14 times before entering Galashiels. It does so twice at Bowshank, either side of a spur that the river meanders around but the railway penetrates. This spur’s geology takes the form of an anticline, the sandstone and seams of shale being folded dramatically upwards by tectonic forces, reaching near-vertical in places; thus the rock is broken and blocky. Above this is a layer of glacial drift. Construction involved a now-hidden shaft being sunk down to track level, with progress effected from the bottom of it as well as the two ends, 250 yards apart. But this approach, whilst complying with convention, was not sufficient to prevent lengthy delays to the programme, the line being opened as far as the north portal six months before the first train actually ventured inside. 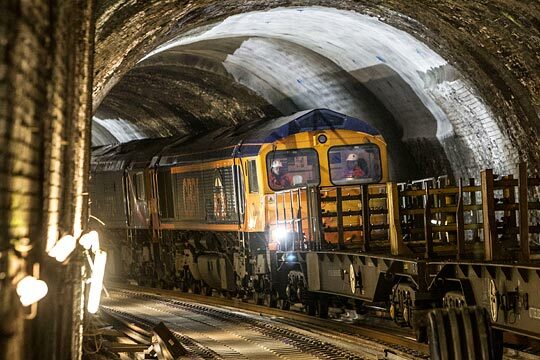 One cause of those delays was a significant surveying error in driving the headings which resulted in the tunnel’s alignment deviating from that planned. This might go some way to explaining the variation in curvature which included sections of 22 chains, 37 chains and 25 chains in radius from north to south. The lining was also poorly executed. 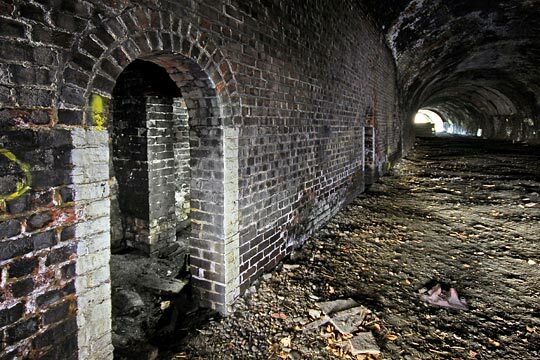 These deficiencies were rectified over the summer of 1875 when an extensive package of improvements was carried out, widening the tunnel by as much as five feet towards its southern end and renewing the arch wherever defects had developed. It was probably during this intervention that a vertical wall was built on the west side, behind which storage rooms were created for the platelayers. An archway through the vertical wall on the tunnel's west side, leading to rooms used by the route's platelayers for storage. The difficulties associated with this work should not be underestimated. Headway was made in 18-foot lengths, dismantling the existing brickwork, blasting away rock and then erecting timber frames to serve as centring for the new arch. In principle, the process was much the same as that adopted at Holme Tunnel on Lancashire’s Copy Pit route in 2013/14. But that involved a five-month blockade. At Bowshank, the labourers had to contend with a procession of goods and passenger trains, single line working having been instigated through the establishment of block telegraph stations at both ends of the tunnel. In those days, performance took priority over almost everything. Like humans, structures suffer an inevitable decline as time takes its toll. Fast-forwarding to the 1950s, we discover distortion of the tunnel’s lining throughout much of its length - mostly affecting the Up (east) side - with areas of brick spalling located close to each portal. At the south end, a flattening of the arch was apparent over a distance of around 37 yards, with the crown having dropped by six inches near the middle of this section, appearing almost horizontal. Steel ribs had been installed at 4-foot centres to provide support but excessive loading was causing these to deform. To address these defects, remedial works started in August 1955, with some lengths of arch being rebuilt to give an additional rise of one foot. More ribs were also inserted. This was however a sticking plaster as specialists had deemed it too dangerous to attempt any repair at the point of greatest distortion. Then, on 18th September, as a 10’ by 2’6” section of brickwork was being cut out, the arch partly collapsed and seven tons of debris was deposited on the track. The foreman had no choice but to close the Up line, over which single line working had again been implemented. The loosening of rock along joint and bedding planes, initiated by tensile conditions at a tunnel’s bored face, usually meets equilibrium some distance above it. However this process was being complicated and prolonged at Bowshank by the proximity of the glacial drift near both portals. It was therefore not reasonable to presume that a permanent state of safe equilibrium existed at any point along the tunnel’s course. Seismic surveys were undertaken and a series of boreholes sunk to gain insight into the local geological conditions. Based on the findings, it was recommended that the overburden at the southern end should be removed and the first 40 yards of tunnel demolished. This would result in a cutting 80 feet deep, at the end of which a mass concrete portal was to be erected. Work progressed mostly from above - minimising any operational interference - but Sunday possessions allowed attention to be focused on the portals, wing walls and lining. The mass concrete portal erected when the tunnel was shortened at its south end. Completion of the excavation element brought an unwelcome discovery: a substantial void above the lining - reaching 8 feet high in places - which appeared to extend throughout the remainder of the tunnel. An adventurer was dispatched into this space to take profiles at 5-foot centres, revealing that several rock falls had occurred which were overloading the arch to a point where its condition could not be regarded as sustainable in the long term. Engineers accepted the need for a larger-scale intervention. Two options were considered. The first involved opening-out the tunnel, but this was attended with significant logistical difficulties, disruption and cost, prompting it to be ruled out; the second called for the void to be filled. Consequently, a 2’6” thick reinforced concrete saddle was formed above the brickwork, effectively rendering the original lining redundant except through the northernmost 25 yards where the arch was rebuilt. Stone was hand-packed between the saddle and overlying rock to fill the remaining void. The construction methodology and means of access are not clear, but it’s fair to presume the venture asked difficult questions of all those involved. Amidst great controversy, passenger services over the Waverley line were withdrawn on Monday 6th January 1969, although goods trains continued to serve Hawick until the end of April. 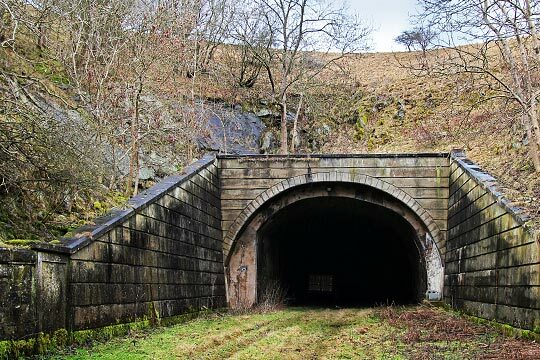 Bowshank Tunnel’s period of disuse was spent largely as a farmer’s store, but restoration to operational status became a likely reality with Royal Assent for the Waverley Railway (Scotland) Act in July 2006. Following procurement difficulties, delivery of the new line was handed to Network Rail in 2011, with BAM Nuttall subsequently appointed as principal contractor. 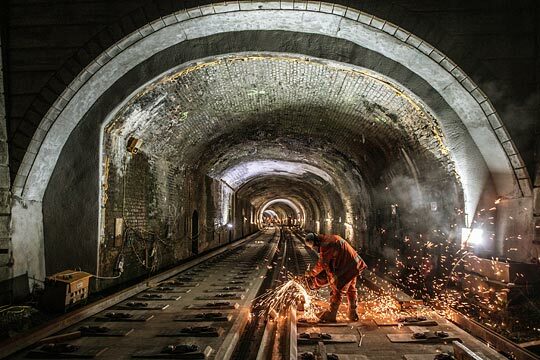 The tunnel’s refurbishment was carried out to a design developed by Donaldson Associates. April 2011 brought a visual examination which raised no particular concerns, conditions being broadly as expected: uneven brickwork, open mortar joints and the like. There was however uncertainty about the purpose of the vertical wall and some surprise that two sections of arch had been removed, 5-10m in length, revealing the concrete saddle. This might well have been done to ease localised structure gauge issues. A year later, a second examination conducted from a MEWP revealed a 50m-long hinge forming at the Down-side haunch, but cores confirming the presence of the saddle did much to restore confidence that this was longstanding and presented little risk. One of two sections of brickwork probably removed to ease structure gauge issues. It was initially concluded, where brick spalling exceeded 40mm, that the outer course of headers would be removed and 150mm of spray concrete applied, pinned right through into the saddle. However the design philosophy evolved over time, moving towards greater enhancement of the existing lining’s factor of safety through brick replacement, repointing and pinning. In the two sections with missing arch, a 225mm spray concrete lining would be installed. At the outset, the removal of bricks to make way for the concrete was undertaken in 3m bays, Datum providing extensometer arrays to enable any movement at either side to be recorded. Temporary GRP pins were inserted for stability, after which the lining was saw-cut to one ring’s depth and strapped to prevent any damage to adjacent brickwork during breakout. A fast-setting regulating layer - containing Xypex waterproofing additive - was then applied, with permanent pins and drainage installed before the lining was sprayed up. In longer sections, hit-one miss-one sequencing was adopted whereby the next 3m panel would be left until the one beyond it had been completed. The approach proved so effective that the bay widths were extended to 5m and eventually up to 7m. Forth Stone was responsible for the brickwork repairs, the materials used matching the original so well that it was often difficult to detect where the work had been done. Arguably the most challenging activity was lowering the invert to accommodate the slab track, a high-fixity solution being needed because of tight clearances. Although the deepest excavation was only 450mm, concerns were raised about possible destabilisation of the sidewalls. 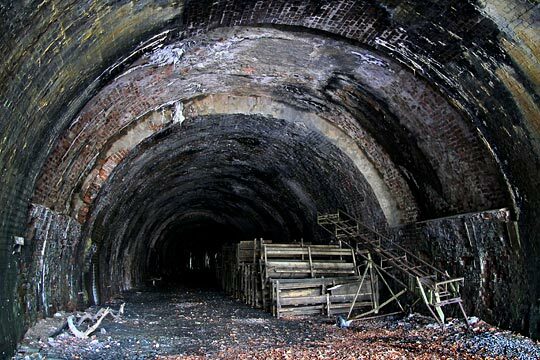 Echoes could be heard here of the tragedy at Penmanshiel when another of John Miller’s tunnels - also in the Scottish Borders and through similar ground - collapsed in March 1979 during an invert lowering operation to permit the carriage of 8’6” containers. Two men were overwhelmed by an estimated 2,000 tonnes of rock. After carrying out investigations to establish the depth of the sidewalls’ footings, the approach adopted at Bowshank was to first complete the linings works, thus providing reassurance that the structure was robust. Thereafter, vertical saw cuts were made into the existing rock invert at a distance 300mm from the toe, to ensure the breaking-out did not impact on the sidewall support zone. Where it had to, those areas were left until the end, after the concrete blinding layer had been poured. The track-laying train passes through the tunnel on the newly-installed Up line. This was an exercise in understanding the causes of a historic failure, learning lessons from it and developing mitigation measures for each identified risk to prevent a recurrence. The process benefited in part from live condition monitoring by engineers on site. Reconnecting the Borders to the railway network is big news, socially and economically. The Twittersphere has been humming, nostalgic locals articulate their pleasure extensively across the press and media, and politicians bask in the glory of it all. The engineering travails of the past three years are already being lost in the memory, but it’s right that we now look forward…perhaps as far as Carlisle. But you can’t see much when you’re inside Bowshank Tunnel. If you ever ride Britain’s newest line, there will be a few seconds when the rural vista succumbs to its darkness. This is something that should be celebrated. Securing this short passageway for the safe transit of your train has demanded years of unseen application, both on the part of riotous navvies and today’s community of professional engineers.